The perfect fall breakfast. 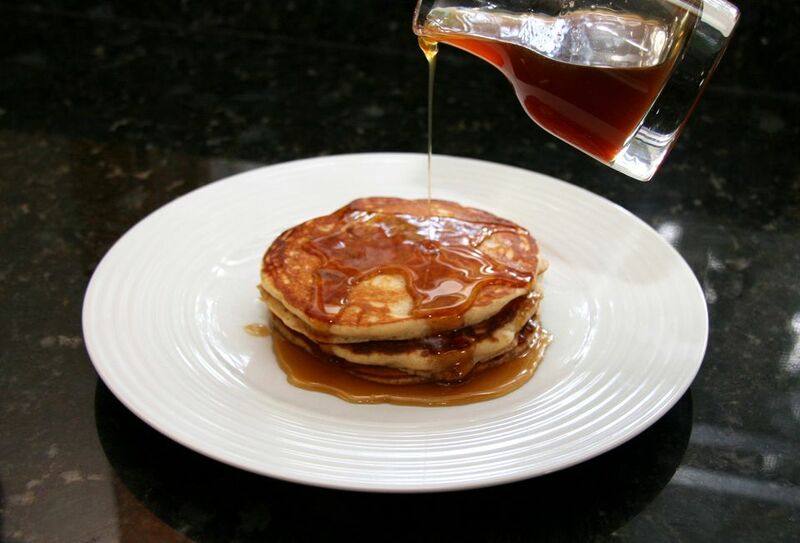 These delicious applesauce pancakes are topped with a fabulous apple cider syrup. Make the syrup the day before to make it a quick and easy gourmet breakfast. In a heavy saucepan over medium heat, melt butter. When butter stops foaming, add the apple cider, brown sugar, and cinnamon sticks. Bring to a boil, stirring. Continue cooking over medium heat, stirring frequently, until reduced by half to about 1 to 1 1/4 cups. This will take about 15 minutes. The syrup will thicken as it cools. Remove cinnamon sticks and serve with pancakes. In a bowl, combine the flour, sugar, baking powder and salt. Combine eggs, milk, applesauce, and butter; add to dry ingredients and mix well. Pour about 1/3 cup of batter onto a lightly greased hot griddle. Turn when bubbles form on top; cook until the second side is golden brown. Keep warm while making the remaining pancakes.